Since I was 10, I’ve been looking for chola bracelets, you know those black rubber ones that were the ultimate chola (and punk rock) fashion accessory in the 70s and 80s? Well, imagine my surprise when I spotted a colorful pack of them at Target being sold as some kind of Halloween costume. Where’s the scary chola costume to go with it? If you don’t know what I’m talking about, Gwen Stefani “borrowed” the look for many years. You only need to watch the first minute of the video to see what I mean (no need to get that song stuck in your head). While she mostly just flirted with chola-ness for a few years, she went all out in this following video. Thanks to the awesome blog Loteria Chicana for the scoop! I thought the exact same thing!! El Chavo is right, Target is quickly becoming the purveyor of cultural fusion. My friend and I went out to dinner with our advisor last night. We chose two Chalino Sanchez and one No Doubt song for the jukebox. My advisor didn’t know about No Doubt, so we told her about Gwen and the music and the chola style. The rant you linked too came up too, because my fellow grad student also hated that video. Whoa– I have never seen that second video. But I’ve tried to ignore Gwen Stefani most of the time. I don’t know why I’m shocked– it’s so shameless. and embarrassing. well that brought back alot of memories. i remember those bracelets. So i went to pick some up @ Target but they were sold out in 5 stores. I will still look this week. I’m gonna dress up as a chola. Those bracelets would top it. Thanks for the info. I saw a pack of them today at the Pasadena Target. Or you could always go to the vacuum repair store and pick up some heavy duty bracelets! Whatever, Gwen, whatever…Cholaisim is a way of life not a Fade…or if your Latina it is what it is…and if you need some just go to the La Mirada SwapMeet they have 10 for a dollar. 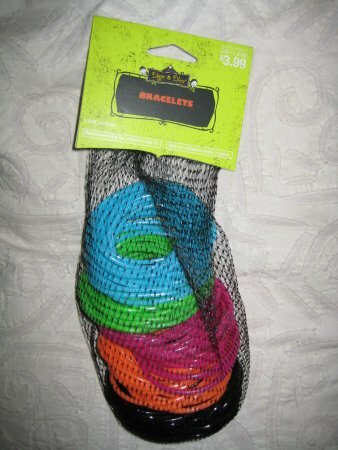 Well, I remember the bracelets, we used to call them spider bracelets, and the ones at Target arent even close! Ours were much thinner, knotting and interlacing them was an art, and the girl with the most intricate design was badass, I had them all the way up to both elbows! The Target version are far too thick and would never lend themselves to the designs we used to make.